In ward 17 of Kurseong municipality, the fight is not just between candidates. The high and mighty of the idyllic hill town also slug it out there. Anit Thapa, the executive member of the GTA Sabha in-charge of public health engineering department and the undisputed leader of the Gorkha Janmukti Morcha from Kurseong, stays in ward 17. So does Samardeep Blone, the former chairman of Kurseong municipality. Prabha Chhetri, the executive GTA Sabha member in charge of women and child development, is also a resident of the ward. So is Laxman Rai, a central committee member of the Morcha. The ward comprises Nayabazar and Rajbari localities and is not titled only towards the Morcha in terms of leadership presence. Pradip Pradhan, the chairman of the GTA Sabha, who is also the chairman of Trinamul's Kurseong subdivision and one of the tallest leaders of Mamata Banerjee's party in Kurseong, also shares the same neighbourhood. For a ward with a little over 1,500 voters, the leader's list is impressive and the fight now is not just between Mani Kumar Rai of Trinamul and Mohan Rai of the Morcha. There is a shadow war between the top guns. The top guns, however, would like everyone to believe that their presence is not needed in the ward as both the parties are confident of victory. Thapa said: "We will win this ward easily. I do not need to campaign here. Pradip Pradhan is not an issue here. Who is he compared to the greater cause of Gorkhaland. Our cadres are enough to ensure our victory as the people of this ward are with us." The former civic chairman, Blone, too, said he was actually campaigning in Mirik subdivision and not in Kurseong. "Trinamul could not even find a proper candidate. They approached many people but at the end, they had to field someone who is known for moving around with Pradip Pradhan," said Thapa. Pradhan, too, said he was not concerned with ward 17. "Today, I was campaigning in ward 10," he said. Some visible development can be seen in the ward. A link road, which the Opposition alleges was built to connect Anit's house, has come up in the area and a three-storied community hall built at an estimated cost of over Rs 3 crore is on the verge of completion. However, for the past few days, the discussion in the hills has been centred more on statehood and identity. Discussions on civic amenities have taken a back seat at least for now. The Morcha has from Day One been pitching the elections as a fight between Gorkhaland and Bengal. 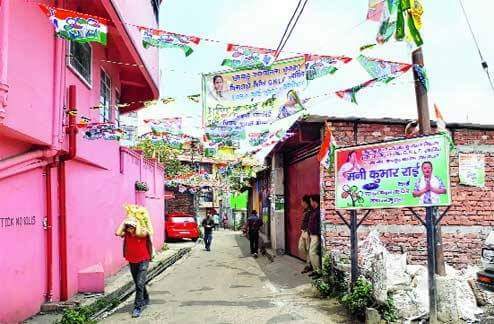 The Trinamul and Morcha candidates of ward 17 believe they do not need any big leaders to win. Mohan, 47, of the Morcha said: "The issue is not about whether I will win or not. People supported my candidature even before the party announced my name. We are just working on increasing the victory margin." Mani, 50, of Trinamul said: "I have told Pradipda not to campaign here. I am concentrating on door-to-door campaign with my party cadres and everywhere I go, people want a change from this corrupt system that is in place now. In fact, they (Morcha) are raising the Gorkhaland pitch. It is turning out to be favourable for me as people cannot understand why Gorkhaland is being raised in a local body election." Bimal Gurung, however, said he would raise the Gorkhaland issue in all forums and in all elections. "I have to achieve Gorkhaland. My sole purpose is to fight for the creation of Gorkhaland and no one can stop me from raising the issue. I will raise it in every forum, every election and with all leaders irrespective of their stature, until we achieve our goal," said Gurung.